Explore the beautiful and colorful marine life exhibits at the Florida Aquarium. Catch a glimpse of an assortment of sea life, including barracudas, sea horses, nurse sharks, sea turtles, and other smaller species of fish. Live marine life presentations are scattered throughout the day. You can even see Penguins on display.There is a wetlands area which showcases the Florida mangroves and birds. Stop by thestingray petting tank, a favorite for the kids. Have the kids bring their swim suits so they can take a splash at the Florida Aquarium’s interactive splash pad. There is a cafe nearby the water play area with food and drinks for purchase. 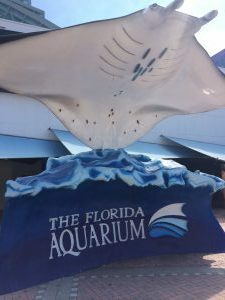 To make this visit more affordable, purchase tickets online at Florida Aquarium. Save even more by purchasing a Tampa Bay CityPass and visit more Tampa Bay attractions for one great price. See updated ticket prices here. Hours: Open Daily 9:30 a.m. to 5:00 p.m. Note: Prices, hours, and dates are subject to change without notice. Visit Florida Aquarium for the latest information.